Many of my friends tend to have sugar cravings and I, on the other hand, tend to crave for savoury food. A couple of days ago, I was craving for creamy pasta out of the blue. Since I don’t usually stock fresh cream in my fridge and I didn’t feel like going out to get grocery, my eureka moment struck when I found a can of coconut milk in my pantry and an opened packet of dry fettuccine. as the flavour base for the creamy coconut sauce. Add 1 Tbsp, 2 tsps Indonesian sweet soy sauce and generous amount of freshly milled black pepper in a mixing bowl. Whisk all these ingredients with a fork until well combined. Toss the chicken breast pieces into the marinade and set aside. Add the chicken in the preheated stir fry pan. (There's already oil in the curry paste hence I didn't add any oil to the pan). 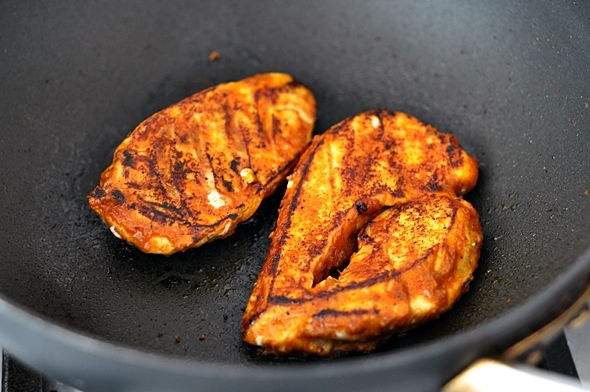 Cook the chicken breasts over medium heat on both sides until fully cooked. Transfer them to a plate and keep warm by covering the plate with aluminum foil. Start cooking the fettuccine according to packet instructions in a separate pot. In a microwavable bowl, add frozen pea and water. Microwave the peas for a minute until the peas are thawed and warm through. Drain the water and keep warm. In the meantime,clean the stir fry pan and return it to the stove. 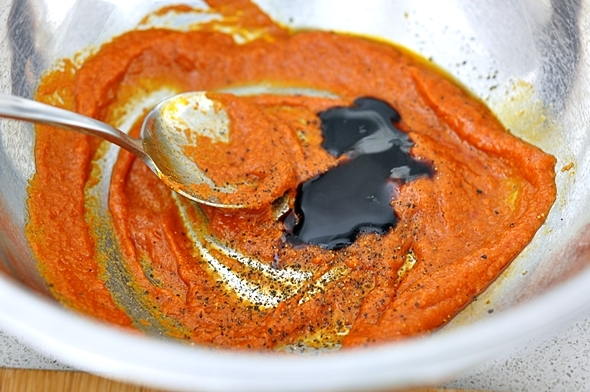 Add a Tbsp of red curry paste and cook over the lowest heat possible until it starts to sizzle. 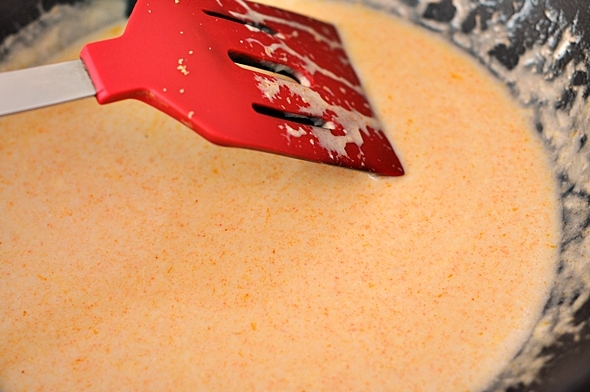 Add coconut milk and cook the sauce over low-medium flame until the sauce is boiling. Season the sauce with fish sauce and brown sugar to taste. Add cooked fettuccine into the sauce and mix well. Set aside. Working quickly, cut the chicken breasts into thin slices. 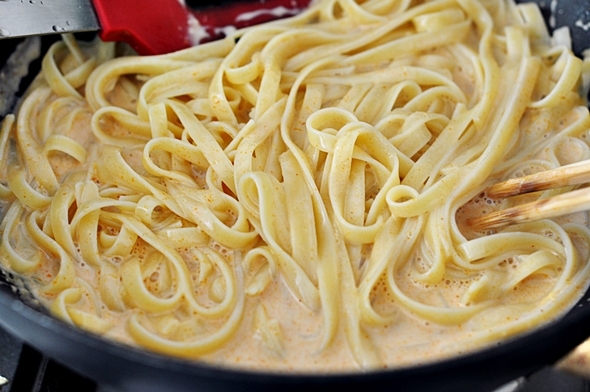 To serve, transfer the fettuccine into two bowls. 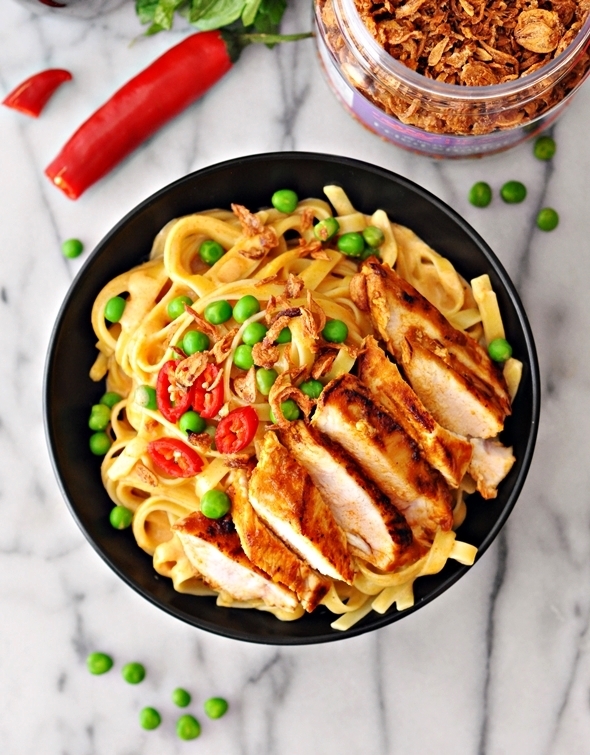 Top with sliced chicken breasts, peas and your choice of garnishes.I used sliced fresh chilli and store bought fried shallots. Such a good idea. 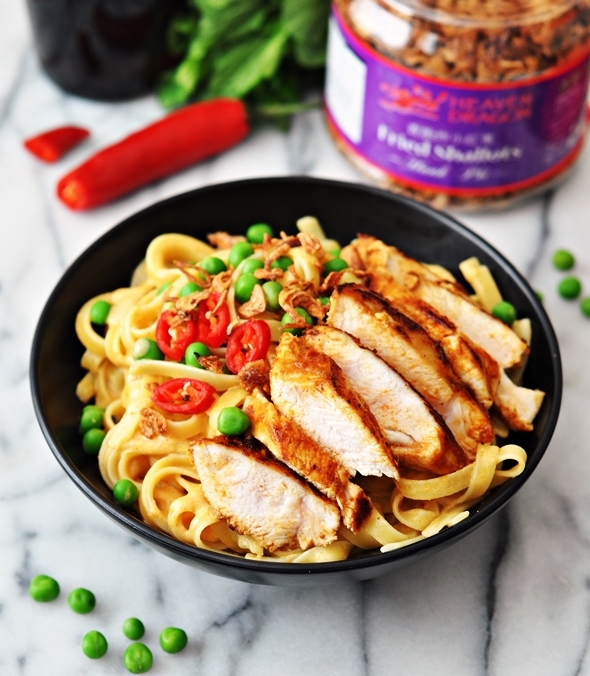 This sounds really fresh and different and a nice substitute for traditional pasta sauces. Many of your recipes, including this one say to marinade the, for example, chicken; but you never say how long it should marinade. Can you give me a hint re length of time you marinade it for please. Thank you for your interest in my recipes! Overnight is always best, but at least 30 minutes would be sufficient. If it is last minute cooking, depending what you are making, I always do the marination first and set aside, in the meantime prepping the rest of the ingredients to be cooked for that particular meal.